Michael Lewis built a legend (erroneously) around the unusual, thrifty management methods of the 2002 A's, but the 2013 A's prove those methods can actually work. The 2002 Oakland A’s are one of baseball’s legendary teams. A hugely bestselling book by Michael Lewis and a popular, critically acclaimed movie starring Brad Pitt, both named Moneyball, will always be synonymous with those A’s. Those A’s famously had no superstars; they won 103 games by acquiring bargain-price players who excelled in often overlooked statistics such as on-base percentage. They won the American League West, losing finally in the playoffs to a wealthier, big-market team. But as I wrote in 2011, the legend doesn’t really hold up under scrutiny. Even after losing Jason Giambi to free agency (and to the New York Yankees after 2001), the A’s had several players who were in the superstar category; shortstop Miguel Tejada was in fact the league’s MVP for the 2002 season. Third baseman Eric Chavez had 34 home runs and drove in 109 runs, and their powerhouse trio of starting pitchers—Tim Hudson, Barry Zito, and Mark Mulder—won 57 games. For some never-explained reason, these five players were scarcely mentioned in Michael Lewis’s book and not at all in the movie. Some of the Athletics’ key players, like Scott Hatteberg, were not acquired at bargain prices; in 2001 Hatteberg was paid a little over $1 million by the Red Sox and over the next three seasons with Oakland he made almost $5 million. Moreover, the 2002 A’s didn’t have an exceptional OBP, finishing 5th in the AL. They won because of their pitching, which delivered the lowest ERA in the American League. And they didn’t lose in the playoffs to a bigger-market team; they lost to a smaller one, the Minnesota Twins. According to Forbes, for the 2002 season Oakland’s operating budget was No. 24 at $172 million with an operating income of $6.6 million while the Twins were ranked 27th at $148 million with an operating income of $400,000. Well, as Maxwell Scott says in The Man Who Shot Liberty Valance, “When fact becomes legend, print the legend,” and there’s no doubt the printed legend surrounding the 2002 A’s will continue to overshadow the facts. 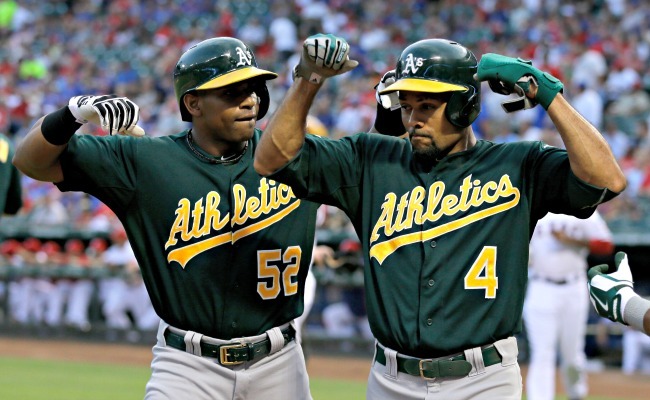 What is peculiar, though, is that Billy Beane’s A’s this year really are a “moneyball” team. They just clinched the American League West with a .596 win-loss percentage—second in the league only to the Red Sox. During September they are 16-5. And they are doing it with a payroll of $60,664,500—the fourth lowest in the major leagues and less than half of the payroll of their downstate league rivals, the Los Angeles Angels, who currently trail the A’s by 16½ games. And they’ve done it all without any superstars. The A’s are arguably the most no-celebrity team among the pennant contenders; most of their players are barely household names in their own households. No team has gotten more return on less investment. Outfielder Coco Crisp (who will take home $7 million this year) has hit 22 home runs and will finish the season with score more than 90 runs scored. Third baseman Josh Donaldson ($492,000) has 24 home runs and has hit over .300 for most of the season. Forty-year old Bartolo Colon (salary: $3 million) has been amazing, with a 17-6 record and a league-leading ERA of 2.64. The Athletics’ fist-pumping closer, Grant Balfour ($4.5 million), a 35-year-old Australian and a much-traveled veteran of four major-league teams, has an ERA of 2.72 with 38 saves. Beane got set-up man Ryan Cook ($505,000) even cheaper; Cook has posted an ERA of 2.59 in 68 games. First baseman Brandon Moss ($1.6 million), age 30, also a veteran of four big league teams, has 27 homers. Yoenis Cespedes ($8.5 million), a Cuban immigrant who was 2012 Rookie of the Year runner up, has hit 26 home runs. And no Oakland A has delivered more wins per dollar than 25-year-old A.J. Griffin ($492,000), who’s won 14 games. Last year the A’s became just the fifth team in major league history to clinch a first-place playoff spot after being at least 13 games out as late as June 30. They’ve never lost that edge. Since July 2012, they’ve had the best overall record in either league. Unlike most teams in the pennant hunt—the Pittsburgh Pirates, for instance, who acquired slugging Minnesota first baseman Justin Morneau—they’ve had no need to shore up the roster with late-season blockbuster deals. “We’re going to the dance,” says manager Bob Melvin (twice named manager of the year, in 2012 with Oakland and in 2007 with Arizona), “with the guys who brung us.” And this year’s edition of the "moneyball" A’s might just do something Billy Beane’s earlier teams couldn’t do: make it to the World Series. Who knows? Maybe there’s another bestseller in the offing.